My blog doesn't contain many deck reviews because I think there are plenty of them available online already. However, I've recently purchased my first Oracles deck - the Druid Animal and Plant Oracle - app; and given that I've used it a lot lately, I thought I should introduce it to the readers. This deck is written by Philip and Stephanie Carr-Gomm and illustrated by Bill Worthington with beautifully intricate watercolour images. The Animal Oracle deck was originally published in the 1990s and the Plant Oracle in 2008, but the app combines them into one electronic deck. In general, I'm not the biggest fan of oracle cards because I see them (possibly wrongfully) as "easy listening" versions of tarot, no offence meant to any oracle readers! However, I do think that pretty much anything that evokes thoughts, feelings and intuitive hunches can be used to do succesful readings and I've tried scrying (reading on water surface or clouds) as well as random image generators online. Nevertheless, I like using tarot the most because I understand its vocabulary - the meanings each card has. The tarot decks I most often use (Rider Waite Smith, Mystic Dreamer Tarot, the Witches Tarot and the Victorian Fairy Tarot) are all based on images of people, giving enough cues about the emotional, mental and physical state each card points to. The Druid Oracle deck contains drawings of animals and plants that were relevant to the ancient Celtic Druids, and this is at the same time the core of its appeal and the biggest culprit, at least for me. The cards are interpreted based on what the animals and plants meant to the Celts and the app deck comes with handy interpretation blurbs. There are separate interpretations for both upright and reversed cards, and the reverse card function can be turned off altogether, if upside-down cards make things too complicated. There are 33 animal cards and 36 plant cards in the deck and almost all of them are familiar fauna and flora to me - these are all common in the British islands and given that I grew up in Scandinavia, we pretty much had the same plants and animals around. However, the familiarity doesn't help much in interpreting the pictures because I don't have any connection to Celts nor their traditions and knowledge about the use of plants. So, my interpretations currently rely on the accompanying info, which makes interpreting a bit repetitive; the texts are fairly similar across the board and most often relate to a spiritual meaning (e.g. the tradition of the Goddess, as well as the story of King Arthur). 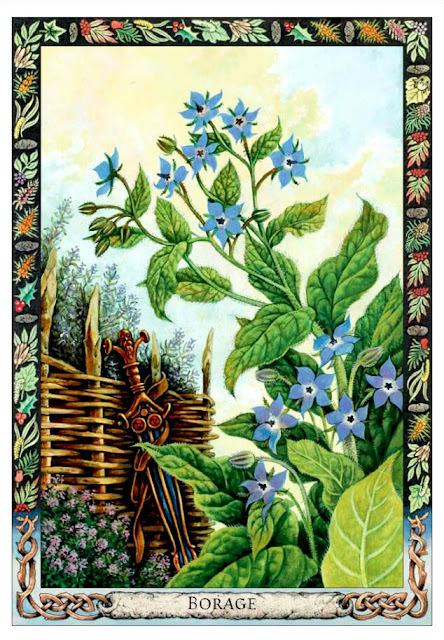 The texts are comprehensive and knowledgeable and I feel I learn something new every time I read the full text, including the meaning of the card, legends or folklore associated with the plant or the animal, and the usage of the plant. This deck is very uplifting due to the down-to-earth, warm nature of the ready-made texts - which are mostly along the lines "connect with your inner self and do what you feel is right" - but I don't find it easy to do longer readings than just a daily card. For checking the day's theme, "energy" or lesson this deck is interesting and accurate, but it seems to be best suited for one, max. three card draws. I've had this app for a couple of months now and I've noticed that I've learned some of the animals and plants quite well, meaning that with some readings I can rely on my own interpretation and intuition only. However, with most of the cards I still refer back to the text and this takes some of the magic away - not being able to understand the meaning in an intuitive flash does not give the same jolt of energy and enlightenment tarot can give. This deck is intriguing and handy for anyone who's interested in the Celtic traditions, because each card also comes with a history summary about the use of the plant (or the symbolical meaning of the animal), as well as an accompanying tale or legend. But for intuitive readings, I still think that cards with people or otherwise expressive symbols work the best for me for gleaning the most informative reading. I absolutely love the decorative, detailed borders of the cards: the decorative leaves and berries remind me of my childhood (I used to have school books with similar decorations and I loved my school years) and hence, create a sense of cosy familiarity with the flora and fauna depicted. Not necessarily the most useful prediction deck, but a beautiful treasure to learn about Celts or moder Druidry, for sure.